The story of CoffeeCup Software began in a real coffee shop in 1994. It was the only place in town (and one of only a dozen or so worldwide) that offered free Internet access so people could come by, order a Cappuccino and surf the web. With a bunch of computer junkies as guests, it was clear that the coffeecup.com domain name had to be purchased and a website for the coffeehouse made. The coffee shop got a little press and other businesses started to call (really, they called instead of email!) about making websites for them too. In the early days of the Internet, software to easily create good looking websites was really hard to find. One day, while chatting with customers about creating and updating websites, the idea of a simple yet powerful HTML Editor was born. We wanted to create a nifty piece of software that would make it easy for people like ourselves to build websites. One of the regulars was a programmer who got to work on a first version of our now famous HTML Editor. The app wrote web history with its debut in August of 1996 on the www.coffeecup.com domain name. The software was an instant hit! People from all over the world were downloading the program and sending us their praises. Building web software proved to be so much fun that we couldn’t wait to develop more web design products. We began integrating FTP and editor functionalities, resulting in the birth of Direct FTP. Then later we released the world’s first web form creating software using a technology cocktail of Flash, XML, PHP and Delphi. In 2011 with mobile usage on the rise the app was rebuilt to be web standards compliant (aka replaced Flash with HTML & CSS). In the last 17 years we have moved the US office a few times, set up a European presence and International development department. In 2008 we relocated our Headquarters to the welcoming city of Atlanta (go Braves!). We simplified web hosting by integrating it right into our software, set up an easy to use web form hosting & processing service, and launched a Search Engine Optimization web service (now replaced by Website Insight). And yea, we also created over 35 web design apps, purchased by awesome people in over 90 different countries and made a bunch of them available for free. Can you see we love the web? Designing and developing ‘web stuff’ is our passion and the rewards have been sweet. Our software and company have won lots of awards including being #400 in the Interactive 500, a ranking of the best Internet and E-Commerce companies. The support, compliments and encouragements we get from our loyal fan base is simply the greatest reward we can imagine. We do still remember the good old days though, when we were just a small Coffee House and many of us had jobs that had nothing to do with the web. We have kept the same level of personal service, delivering tech support and web design advice with a smile with the most complimented support team on the web. CoffeeCup truly has grown beyond our wildest dreams and now we’re about to write Internet history again. It’s September 2007, we just started a project we labelled ‘Layout Maker’. At that time, more and more of our HTML Editor customers were transitioning towards CSS based layouts. The advantages were great, but the learning curve was significant. A tool like Layout Maker would greatly simplify the process and improve the understanding of the mechanics of these code structures. There was another good reason for starting the Layout Maker project: for the first time in web history it would allow web designers to make real, interactive mockups and wireframes resembling the browser experience. Unfortunately we had to put the project on hold early 2008, the technology and web were simply not ready for the application we envisioned. Enter 2012, the Internet has made a tremendous leap and became part of daily life for a large part of the world’s population. The Internet community more than doubled since we first worked on our Layout Maker project, swelling to over 2.27 billion participants. The mobile revolution accelerated the overall user acceptance, and website owners started experimenting with tailored solutions for mobile users. We just can’t count how many times our customers asked for software to build mobile sites! We’ve never felt comfortable making device specific solutions. Dedicated mobile sites were found to be expensive to develop, impractical to maintain and came with negative side effects such as a lower search rank. But we just knew what to do and started our responsive journey full of heights and depths. It’s going the be a bit more technical from here on, brace yourself, here we go! The plethora of mobile machines and ubiquitous web access caused a shift in the way the web is consumed. The only way to assure a consistent experience across all these devices is a design that adjusts or ‘responds’ to the available display space. Not by zooming out, that would make everything unusable small, but by reorganizing the content and scaling where appropriate. Indeed responsive design proved to not only be an exciting, but also the only viable solution. Coding responsive layouts by hand is a complex and time consuming operation though. How do we know? We responsified our own site and there were no tools on the market to sweeten the design process. Our team had a flashback to our early days when the world needed a good html editing tool. The only help we got was from our editors, hands and brains. Making mockups and wireframes for all possible device widths proved impossible. 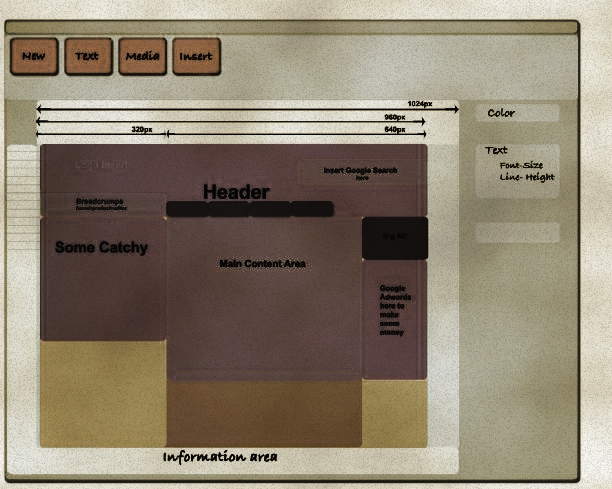 Besides, the static nature of the existing mock up tools did not do justice to the interactive character of the web. It was 2012 and the problems we identified in 2007 were back tenfold! At the time of this writing it’s July 2013, about 14 months after we had our very first responsive framework working. And about 8 months past the date we expected to release two revolutionary responsive apps. Wow again right? You see, responsive design is different and more tedious than a lot of people (and some other app builders) think. Responsive design is NOT making a few tweaks at two arbitrary screen widths. Responsive wireframing is NOT making wireframes for one desktop, one tablet, and one mobile screen size. Responsive design and wireframing is making your design look good, and assuring your layout and content are usable on big desktop monitors, television screens, small smart phones, AND EVERYTHING PIXEL IN BETWEEN. And for that you need a Sizer and a Breaker, we sure hope Ethan Marcotte, two time speaker at our notorious Web Jam Sessions, agrees! Passionate as we are, we wanted to tackle this the right way. We wanted to allow you to view the design at every possible screen width and make real responsive layouts. Layouts that can scale, shift, stack and swap where needed. We wanted you to be able to generate your own grid and use subgrids for flexible layouts with custom breakpoints. We wanted to give you easy to use controls for changing widths, floats and spans (plus other styles) at each of your breakpoints in real time...and all that wanting came with a price (time time time). When we finally got it all working we did the high five jive and shouted: persistence pays! The best part - the responsive framework was so versatile and robust that a whole series of cool (responsive) apps could be created with it, so if you have ideas or suggestions, let us know. When Christmas 2012 was upon us, we just could not keep this a secret any longer. We made a series of posts (that we later compiled in one) about the basic principles of responsive design and gave everyone a glimpse at the cool apps in the making. Solid foundations were in place for software which solved several of the most challenging aspects of responsive design: navigation, wireframing and layout building. Endless amounts of energy drinks and healthy food (pizza, burgers and chocolate) supplied us day and night as we tested and tweaked the apps inching closer to our goal. Indeed, inched. Making robust, maintainable, high performance software is never easy and the framework needed some extra love as we came closer to our goals. We’d love to give you all the juicy details that went into the making of these groovy apps but we as we learned from our Atlanta neighbor, Coca-Cola, the secret recipe must stay classified. The Gatekeeper protects our vault and there is no getting past him. Being unable to adjust or add breakpoints for your specific content needs, is not responsive. In the meantime our commander in chief, Bob, stomped his feet and declared that he would stop shaving his beard until the apps were ready for release. He knew just how important these tools would be to our customers but agreed this had to be done the right way. So we held him to it while we continued to extend the framework and develop controls for the apps that would make real responsive design possible. As the days passed and turned into weeks our team was faced with a beard growing out of control and a face that started to itch. Our frameworks and apps were improving and growing stronger every day, showing of their incredible powers during internal demos and to a select group of web family and friends. 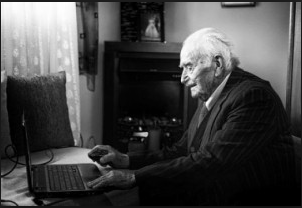 Gran’pa was even offered a job in a high profile design agency when they stumbled upon a responsive site structure he had whipped up with Layout Maker! In the meantime our own website, now powered by some of our freshly brewed technologies, became ready for the responsive spotlight sooner than expected. That made us decide to do this in the proper order. First launch our responsive site with a fresh look, then release the new responsive products with product pages that are, well...responsive. And with articles and forums that are easy to read and use on tablets and phones. And support rooms that are functional on all devices and a mobile navigation menu — everything is just flat out better in a responsive site! With the fresh site and apps anxiously waiting to be released somebody took the opportunity to freshen up his face as well. There are many aspects to responsive design and we’re dedicated to bring you the tools you’ll need to master them all. Instead of popping open the champagne bottles to welcome the release of Menu Builder and Layout Maker we're moving full speed ahead into the next projects. Developing solutions that solve responsive design challenges is a serious and time consuming job — oh where did the good days go? Luckily our technology platform serves as a solid basis for a gazillion more cool apps. Developing responsive site and shop apps is an obvious next step. There’s other challenges to be solved as well. Techniques for conditional loading and responsive images are available, but they really would need to work directly with applications as mentioned above. And what about website components as photo albums and web forms? Right now Web Form Builder uses responsive templates, but would it not be awesome to have full control over the form layout and content at every screen width? And have galleries that load reduced size images depending on the device or connection? Our platform is well equipped to do all of that, but we do need a bit of time... The more support we get, the faster we can create the responsive future for us all!